In this Oct. 23, 2018, file photo specialist James Denaro works on the floor of the New York Stock Exchange. The U.S. stock market opens at 9:30 a.m. EDT on Monday, Oct. 29. NEW YORK — Stocks are falling sharply on Wall Street, erasing an early gain, following a report that the U.S. will announce tariffs on all remaining imports from China by early December if the two countries can’t make progress in resolving their trade dispute. Technology and internet companies, industrials and retailers took steep losses as Wall Street’s recent bout of volatility continued. The S&P 500 index has taken steep losses in October and is on track for its worst month since the financial crisis. The Dow Jones Industrial Average fell 381 points, or 1.6 percent, to 24,306. It was up 352 earlier. 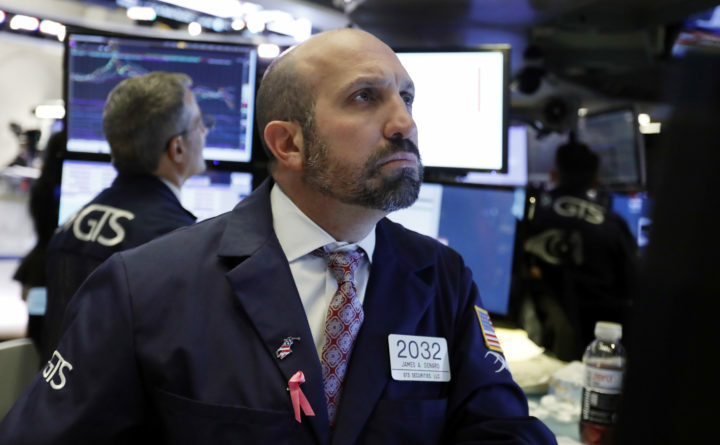 The Nasdaq composite, which is heavily weighted with technology stocks, lost 176 points, or 2.5 percent, to 6,990 The Russell 2000 index of smaller-company stocks gave up 12 points, or 0.8 percent, to 1,471. TARIFF THREAT: Bloomberg News reported that the Trump administration will put tariffs on the rest of the country’s imports from China if Presidents Donald Trump and Xi Jinping don’t make substantial progress in easing the trade dispute next month. The U.S. has so far placed $250 billion in taxes on imported Chinese goods and has threatened tariffs on the rest, while China hiked tariffs on $110 billion in imports from the U.S. Among industrials, Boeing plunged 8 percent to $330.63. Some early gains for tech and internet stocks also faded. Microsoft shed 4.1 percent to $102.68. Alphabet, Google’s parent company, lost 6 percent to $1,007. Amazon.com dropped another 8.5 percent to $1,503. The online retailer tumbled Friday after it reported weak sales and gave a lower-than-expected revenue estimate for the quarter that includes the holiday shopping season. Amazon is nearing a “bear market,” a Wall Street term that means a decline of more than 20 percent from a recent peak. Amazon traded above $2,000 a share in early September. DO YOU LIKE MY HAT? IBM said the purchase of Red Hat will help the company take the next step in cloud computing. Chairman and CEO Ginni Rometty said the deal will make IBM the world’s biggest hybrid cloud provider, meaning it will offer companies a mix of on-site, private and third-party public cloud services. It’s also the largest purchase in IBM’s history. Red Hat stock soared 45.9 percent to $170.28, reversing its losses from earlier this year. IBM fell 4.6 percent to $119.04. CHANGING GEARS: Automakers were a standout after Bloomberg News reported that regulators in China intend to propose cutting the tax on imported cars to 5 percent from 10 percent. The trade fight between the U.S. and China has hurt sales, and that slowdown is one of several factors that have damaged car company stocks this year. General Motors jumped 1 percent to $32.98 and Ford climbed 3 percent to $9.25. Auto parts companies also rallied. BorgWarner jumped 5.3 percent to $39.29. After Cooper Tire & Rubber reported a bigger third-quarter profit than analysts expected, its stock surged 20.9 percent to $30.77. EUROPE: Italy’s FTSE MIB index rose 1.9 percent after Standard & Poor’s did not downgrade the company’s credit rating into “junk” status. Italy’s new government plans to ramp up spending and European Union leaders have demanded it change its plans. Germany’s DAX rose 1.2 percent as Volkswagen, Daimler and BMW made big gains. Longtime Chancellor Angela Merkel said she won’t leave office following weak state election results, but will step down as leader of her party. She has been chancellor of Germany since 2005 and will stay in office until 2021. BRAZIL: Brazil’s Bovespa rose in morning trading after far-right politician Jair Bolsonaro was elected president, but it later turned lower and fell 2 percent. Stocks climbed earlier this month after Bolsonaro led the previous round of voting, as investors preferred him to leftist parties. BONDS: Bond prices recovered from an early loss. The yield on the 10-year Treasury note remained at 3.07 percent. METALS: Gold lost 0.7 percent to $1,227.60 an ounce. Silver fell 1.8 percent to $14.44 an ounce. Copper was little changed at $2.74 a pound. ASIA: Tokyo’s Nikkei 225 sank 0.2 percent and Seoul’s Kospi lost 1.5 percent. Hong Kong’s Hang Seng advanced 0.4 percent.